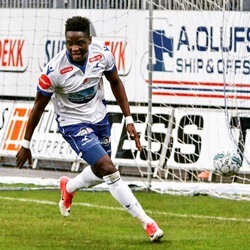 Norwegian champions Rosenborg are on the verge of completing the signing of talented Nigerian winger Babajide David. Our friends at tipsbladet.dk first reported the information that FC Midtjylland attack-minded player David will wear the jersey of Rosenborg in 2019 and this has been confirmed by the player's agent Cedric Mazet. The FC Ebedei product put himself in the shop window after contributing to 15 goals (9 goals, 6 assists) while on loan at Haugesund in 2018. ''Yes Babajide is joining Rosenborg subject to medicals. It's a one-year loan deal with option to buy him at the end of the season which will be defined later by the two clubs,'' said Mazet to allnigeriasoccer.com. ''He chose Rosenborg because the challenge is clearly good, good club to continue his development. ''He will be with the same coach he was with last year in Rosenborg this season. Babajide has been loaned out to Thisted, Jerv and Haugesund since transferring to Midtjylland in 2014.